Home » Personal Finance » Insurance » What Does Checked Baggage Insurance Cover? When you travel by air, it's only a matter of time until you have this experience. You wait at the baggage claim area as bags arrive until you realize that you're the only one left standing there. A few stray bags make laps around the carousel, but yours isn't among them. Whatever chance you have left to see your bags that day disappears when the carousel stops turning, and you trudge over to the baggage service area, feeling defeated. Before this happens to you, you should understand the checked baggage insurance that your credit card offers, as well as other options, and what they will cover. On a domestic flight, federal regulations state that the airlines are liable for $3,500 per checked bag. You'll have to submit a claim with details of the contents of your luggage, so the amount you're reimbursed could well be less than that $3,500. Also note that many items are excluded including jewelry, electronics, antiques, cash, and other monetary instruments. When traveling internationally, the airlines' limit of liability is set by international conventions. If both countries are signatories to the Montreal Convention (more than 100 are, including the U.S.), liability is capped at 1,131 of an obscure international monetary concept known as "special drawing rights." In practice, this works out to about $1,600. Among the perks your credit card may offer are two different types of baggage insurance. The most common one is lost baggage insurance. As its name indicates, this coverage only applies when a bag is truly lost, not when it is merely delayed. Many credit cards offer lost luggage insurance, which is secondary to the reimbursement offered by the airline. 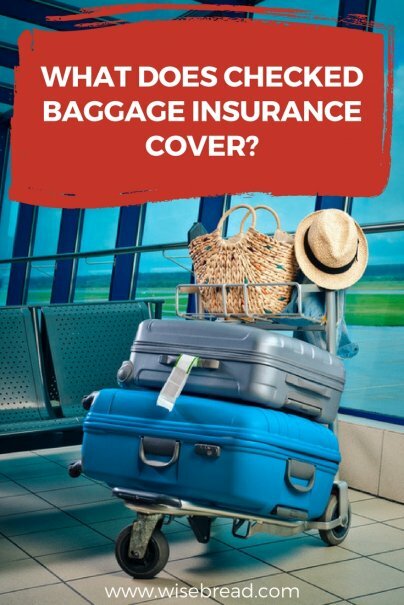 To use this insurance, as well as to make a claim with the airline, you must immediately report your lost baggage and retain written proof of your claim. The coverage will apply whenever you pay for your tickets or those of a family member with an eligible credit card, and in some cases, when you use your reward points. Note that credit card coverage is usually secondary to whatever reimbursement the airline or other common carrier provides you. It's also secondary to any baggage insurance you may have purchased. If you have your suitcases clearly marked with your name and contact information in multiple places, then it's unlikely that your bags will be lost forever. More likely is that they will fail to make your flight, or be misrouted to another destination. When this happens, it can take days, or even weeks before your possessions are returned to you. Some premium travel rewards cards provide baggage delay insurance, depending on the length of the delay. For example, your benefits may kick in when your luggage doesn't arrive within six hours of you, so long as you paid for your flight with the card or with points from the card's rewards program. Like lost baggage insurance, the coverage provided by your credit card is secondary, which means it will only cover expenses that the airline or any other coverage won't. Typical credit card coverage might offer you up to $100 per day for items such as clothing, toiletries, and a charger for a mobile phone. The coverage is valid so long as you used your card to purchase the airfare. And as with lost luggage claims, it's vital that you report your delayed baggage before leaving the airport, and keep a copy of all of the documentation that you're given. Another way that you can insure your checked bags is to buy a travel insurance policy. While this coverage is not available by itself from travel insurance companies, it's often included as part of a larger policy that covers travel delays and cancellations. Finally, you can purchase additional insurance from many airlines (though they don't call it "insurance" because they're not insurance companies). For example, United will sell passengers excess valuation for $1 per $100 of coverage beyond its liability limit of $3,500 for travel within or between the United States, Guam, Puerto Rico, and the U.S. Virgin Islands. So, if you need an additional $1,000 of coverage, it will cost you $10 each way. Since you can use both the coverage offered by the airlines and your credit card, you can be reimbursed for most items you check. Nevertheless, it's important to closely examine your credit card's baggage insurance policies if you plan on relying on its coverage. And if you have to pack items worth more than the value of these policies, consider purchasing excess valuation from your airline. By closely looking at what these policies cover, and their limits, you can choose the right combination of coverage for your needs.